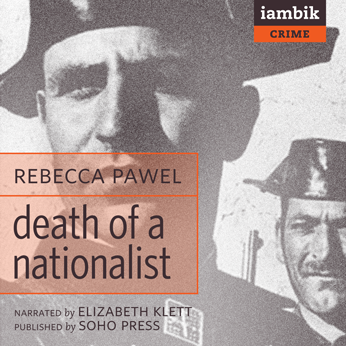 My most recent audiobook download from Iambik.com is Rebecca Pawel’s novel Death of a Nationalist. Set in 1939, in the early days of Franco’s Spain, it’s a murder mystery that doesn’t shy away from the complexities of history. …The Spanish Civil War, often considered a practice run for WWII, has only recently ended. The short-lived Republic is no more. The Nationalists, backed by Nazi Germany and Italy, are the winners. The remains of the Republican army – a mixed bag of Communists, Socialists and Anarchists backed by the Soviet Union & Mexico, (and more quietly by England & the U.S.) – are in hiding. Once discovered they’ll be imprisoned… if they are lucky; “taken for a walk” if they are not. All in all, this is not a good time in the history of Spain. People are starving in the streets of Madrid and the black market thrives. The population is still divided over the recent war. Death of a Nationalist opens with the murder of a member of the Guardia Civil, the often corrupt civil police force tasked with restoring order and normalcy to the city. The murdered man’s best friend and fellow Guardia, a Sargeant Carlos Tejada, is determined to find the killer. What follows is an investigation fraught with wrong turns, mistaken beliefs, moral ambiguity and a number of red herrings. All of which plays out against a vividly rendered historical backdrop. So well rendered that at the end of the audiobook I was looking for the name of the translator. Guess what? There isn’t one. Rebecca Pawel was born in New York City. She’s still alive and still writing books. Death of a Nationalist (published in 2003) is the first in a series featuring Sargeant Carlos Tejada Alonso y León. A series that now consists of four books. My point is: Death of a Nationalist has all the strength and authenticity of a novel written in the 1930’s. The writing style, historical details and psychology of the narrative reminded me so much of Nada by Carmen Laforet that I completely mistook Pawel for a contemporary. There is an immediacy to the events and opinions, an absence of hindsight, that I thought would be hard to create so long after the fact. Death of a Nationalist throws you head first into the plot. A young schoolgirl witnesses the murder of the Guardia, and that random act creates a domino effect that changes the course of her life and the lives of her family. Pawel keeps a large cast of characters at her disposal. To her credit I never felt lost or confused. Everyone fit neatly into place without the plot being formulaic. The main protagonist, Tejada, is something of an anti-hero. He’s a fascist, not your typical knight-in-shining armor. His beliefs make him unpredictable. That unpredictability only increases the suspense. As for the audio: Iambik has come a long way in a short time. More indie publishers are on board, more audiobooks are available – their library is constantly growing. Now, when you click on the book title it takes you to a page where you can listen to a segment and decide whether or not you like the narrator’s voice. A feature which I love! Elizabeth Klett, who narrates Death of a Nationalist, does a great job. Her character voices are nuanced, each is imbued with subtle individuality. I’ll definitely be listening to more of her work. And I’ll definitely be looking for the next book in this series. Which, sadly, is not yet available in audiobook. Death of a Nationalist is available in traditional book form through Soho Crime.